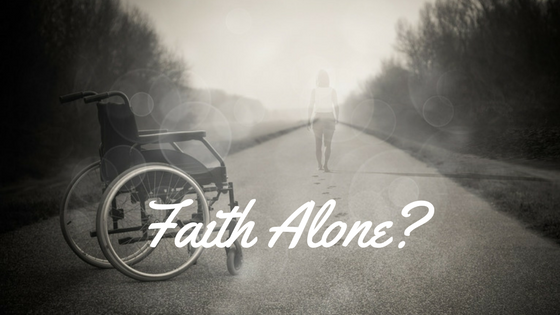 Does Faith Stand Alone or Does Faith Require Action? Before the sun showed its face, or birds began their song, even before my eyes fully focused, I read this penetrating verse, “…faith by itself, if it is not accompanied by action, is dead!” (James 2:17) Is it faith alone or does faith require action? Now that is dead! Other versions expound by adding “inoperative and ineffective” or “useless“. I highlighted the concept this way in my journal, mainly because I sometimes just need things spelled out plainly and simply. Faith is never intended on being an isolated bubble of our spiritual journey. Rather, faith is designed to be intricately and solidly merged into our conversations and actions. At the same time, the shadow of the cross lands on these truths: I am made righteous in Christ and I can do nothing to merit or earn salvation! Paul as an Example – Faith Alone? This is not exhaustive list, but it is enough to bring me to attention. “But this is Paul an apostle! Miracles don’t happen like that today,” might be the response from most. Perfectly logical and understandable! Let’s remember Paul was just a Jewish radical defending his belief system before meeting Jesus tangibly. Since when is faith logical or understandable? I have often wished it was that easy! Unfortunately, I have been unable to stuff it into either of these two hefty containers. In fact, faith explodes all boundaries and catapults beyond human reason! When I read the faith chapter of Hebrews 11, none of the actions of these men and women of faith were either rational or explainable. None! Yet, the volumes that have been written honouring and exemplifying their active faith continues to grow. releasing the life of Christ. “It is impossible to please God without faith. The word “reward” embodies the idea of “restoring and renewing“, but the prime meaning is “to watch“. Furthermore, it is interesting that it also has a governmental or legal aspect of giving to someone what has been promised or is due – to settle an account. I love it! God is watching and waiting for us to take Him at His word in active faith. As we do, He restores, renews, and watches over us seeking opportunity to fulfill His promises. Forgive me for believing small! upward faith and outward action. I thank You, Lord Jesus!